The concept of the “Asian Consumer” has captured the attention of many investors. However, talking about the Asian Consumer as a homogenous group is misleading. A closer look at demographics, household income, urbanization, gender purchasing power and channel shift, shows that there are at least 10 different consumer groups within the Asian region: young, old, high income, low income, male, female, urban, rural, online and offline. The following focuses on the dichotomy between young and old consumers in Asia and shows that a deeper understanding of their consumption patterns results in more nuanced stock picks, often in non-consumer sectors like technology and financial services. We like Tencent, Alibaba and Naver as stocks to play Asian Millennial consumers and AIA and hospital stocks as ways to play Ageing Asia. The term Millennials refers to people born in the 1980s and 1990s who are now 17-36 years old. Of the 7 billion people worldwide, approximately 1.8 billion are Millennials and roughly 60% of them live in Asia. 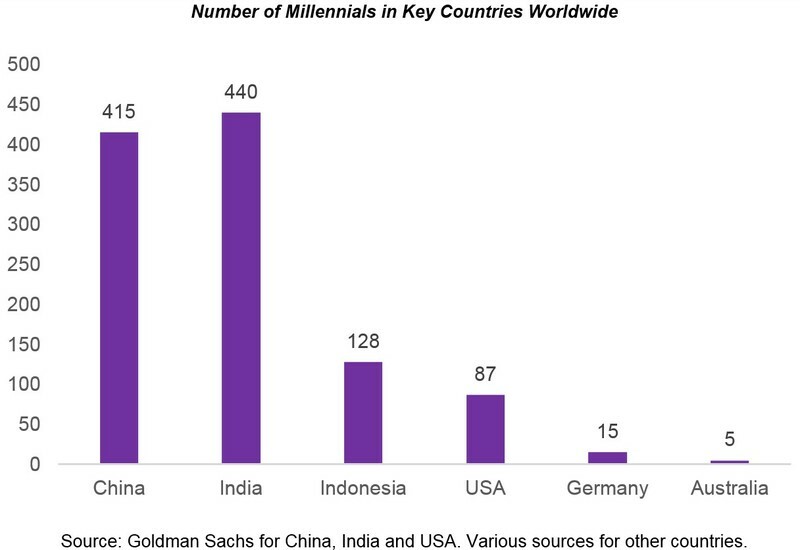 There are currently 415m Millennials in China, 440m in India and 128m in Indonesia. As shown in the chart below, these 3 countries combined have a Millennial population that is more than 10x larger than the Millennial population of the United States and roughly 200x larger than Australia’s Millennial population. One important characteristic of Millennial consumer behaviour is their use of technology. They have been dubbed the “Digital Generation” by some marketers and according to a recent survey by Goldman Sachs, 24% of millennials worldwide agree that tech is what sets them apart from other generations. To address the tech-centric aspect of Millennial consumption, we adopt a very broad definition of consumer. 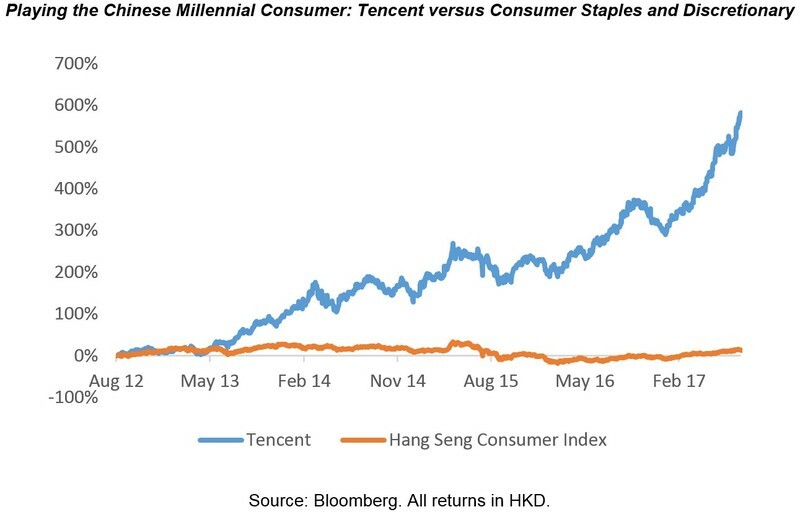 Our research shows that often owning technology companies, like Tencent, Alibaba and Baidu in China or Naver in Korea, provides a better way to play the Millennial consumer than owning consumer discretionary or staples stocks. To illustrate this point, the chart below plots the stock price of Tencent versus the Hang Seng Consumer Index over the last 5 years. Tencent has increased 583% over this time frame, whereas the Consumer Index has posted a return of only 13%. In terms of challenges, Asian Millennials have been described as hyper-brand conscious, but not particularly brand loyal. Millennials spend an average of 2.8 hours on their mobiles per day and are more likely than any other consumer group to consult online product reviews prior to purchase. This results in a consumer cohort that is not only hyper-connected, but hyper-informed about the products they buy. Developing product that is “authentic”, a major buzz word with Millennial consumers, and maintaining brand loyalty is a major issue for Asian consumer companies. Identifying and avoiding which products and stocks will be losers in this regard is an important part of our consumer sector investment process. One example of a stock that did not pass the Millennial litmus test is Want Want, one of the largest beverage and snack food companies in China. Want Want’s star product is (was) “Hot Kid Milk” (see image below). The kids who drove sales of this product in the past are now young Millennials (aged 16-20) and the brand has not kept up with their tastes and preferences. Similarly, older Millennials (aged 31-35 and also called the Young Parent cohort) wouldn’t dream of giving a fake tasting, long life milk product that is full of sugar and artificial flavours to their child. As result of this dynamic, and other factors, Want Want’s stock price fell almost 60% from its 2014 high of $HK13.00 to its current price of $HK5.50. On the other end of the Asian demographic spectrum is what we refer to as Ageing Asia. Japan has one of the oldest and most rapidly ageing populations in the world. The United Nations anticipates that almost 30% of the Japanese population will be 65 years or older by 2025. Other Asian countries such as Korea (13%), China (10%), Taiwan (11%) and Hong Kong (15%), have aged populations that are greater than the global average of 8%. 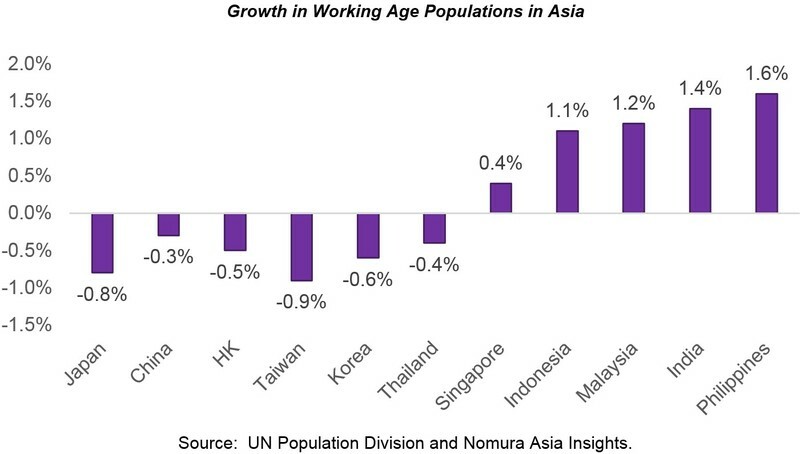 The chart below shows that as a result of this ageing dynamic, every country in North Asia has a shrinking working age population (aged 15-64), whereas almost every country in South and South East Asia has a working age population that is growing strongly. Longer life expectancy, higher incomes, fewer dependent children and earlier retirement, means that these non-working age consumers have more to spend and longer to spend it. Just as we access the power of the Millennial consumer via technology stocks, we take a broad view of consumption for Ageing Asia as well. Obviously good consumption stories can be found in discretionary and staples, however our analysis shows that there are better Ageing Asia consumption plays in the financial services sector (insurance and wealth management) and health care (hospitals and pharma). AIA Group, DBS and Bumrungrad Hospital are examples of stocks we like in these areas. This analysis highlights that the Asian Consumer is not a homogenous group. Understanding the differences between cohorts of Asian consumers helps investors make more targeted stock picks and avoid the pitfalls of chasing a popular thematic. Importantly, some of the best consumer stories in Asia are in non-consumer sectors like technology and financial services.